One of the biggest differences between teaching adult basic education and teaching K-12 is the classroom. Teaching adult literacy and GED Test Preparation, I taught everything from basic pronunciation to chemical equations. WHERE you explain poetry or fractions… that could be anywhere. Literally half of my time teaching adults had nothing to do with teaching. It was mostly: drive to a community center, set up, coordinate tutor-student pairs for 90 minutes, clean up, drive to another site…repeat at a shelter, in a church basement, or an outreach program. At one point my schedule took me to two sites each day, four days a week, with Friday to do paperwork. Where I teach religious education, full of multi-purpose rooms. Looks a lot like other places I taught adults. On Monday morning, I would walk into a church multi-purpose room and unlock a metal cabinet. From there I would pull out the supplies I needed to make coffee. Next I would put out the sign-in sheets next to a crate of manila folders documenting student work. 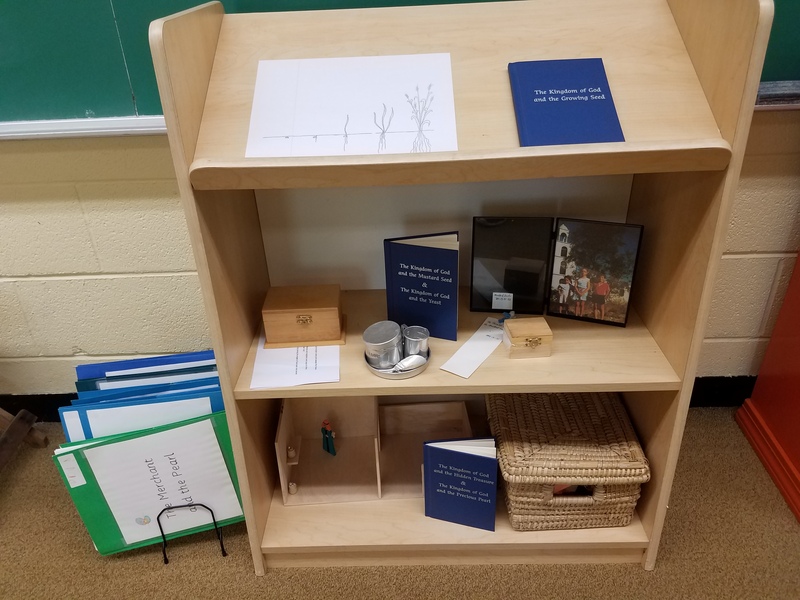 Usually our cabinets held shelves of workbooks and I would have to go down the hall to make copies in the office, usually in the middle of “class.” We had a few well-used manipulatives like flashcards, fraction stacks, and colorful bingo chips. But since adults in my programs worked at their own level and pace, we never had large group lectures. Instead of cramming everything in one metal cabinet, I can space it out for the children to access. Imagine: each person deciding where to sit, most of the time head down in focus, or leaning over to talk with a tutor. 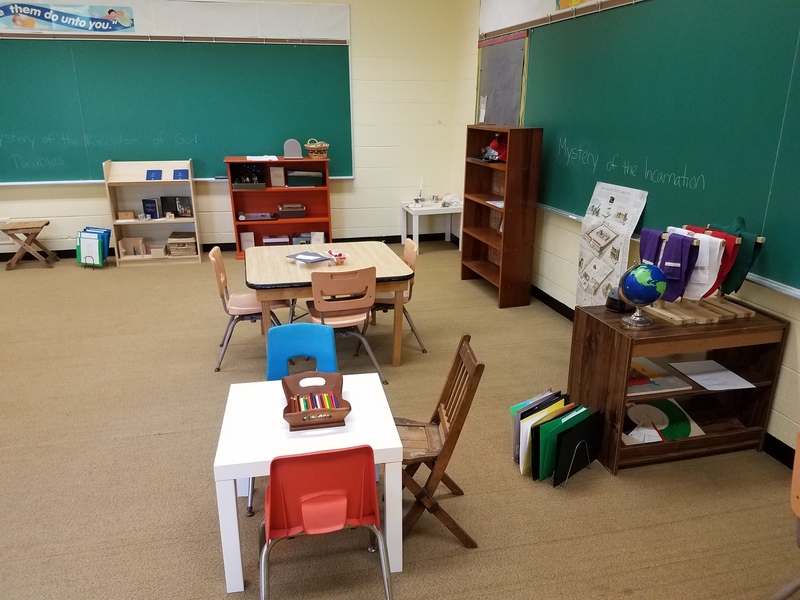 Everything else about the space changed between each class I taught: round tables, long rectangles, desks against a wall… plastic chairs, folding chairs, pews in a hall… One site we were surrounded by high ceilings and stained glass windows in the back of a church. 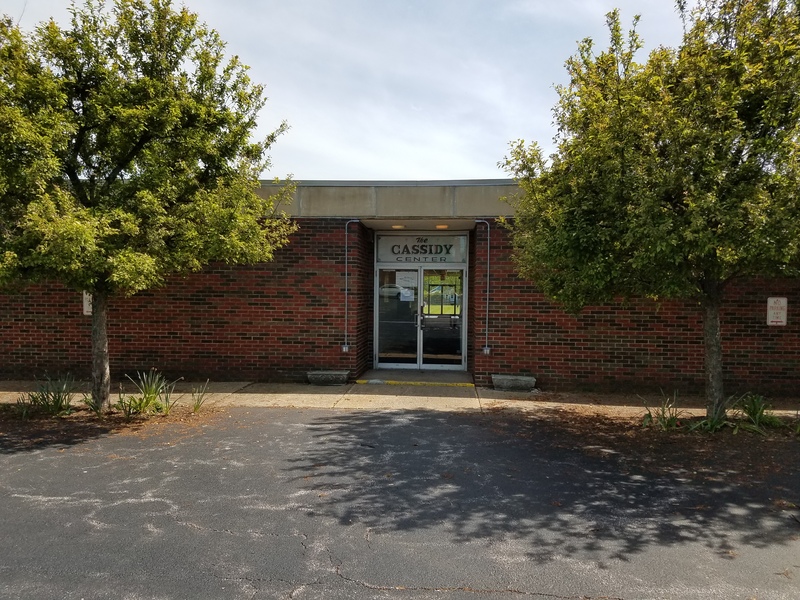 Another site was a dimly-lit, cinder block basement with moldy carpets. Teaching adults, even as a teacher trainer traveling from workshop to workshop, I rarely had any control over the lighting, the chairs or tables, the temperature, the decorations on the walls… I learned to just walk into a place and make it my own as best I could. I learned to ignore or adjust to the physical backdrop and focus completely on individual students and the words and numbers in front of them. 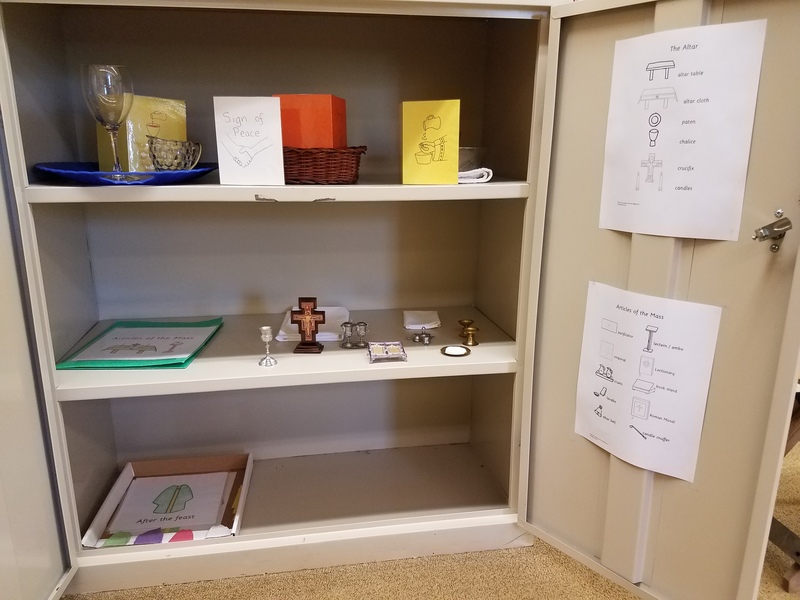 As a volunteer catechist (that’s Latin for “teacher”) at my local church, I finally have my own classroom. 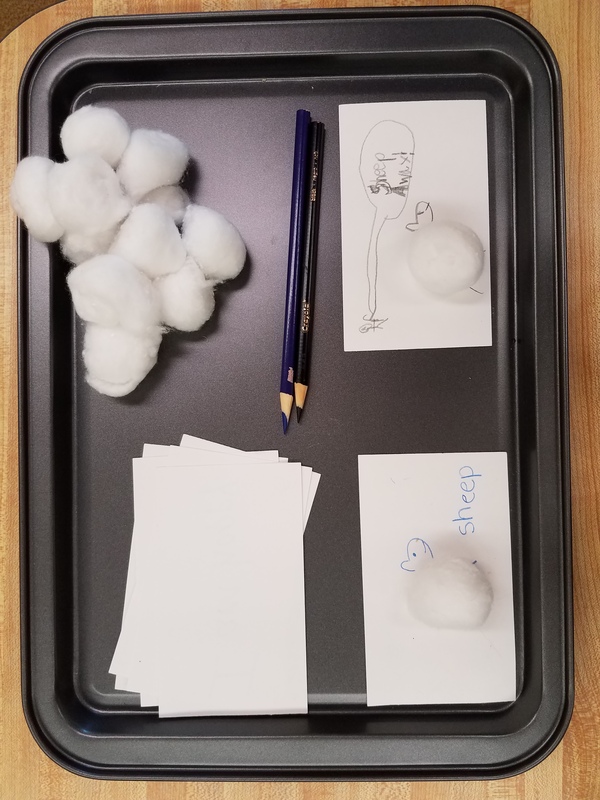 I teach 3-6 year olds using a Montessori-inspired curriculum called Catechesis (Latin for “teaching”) of the Good Shepherd. 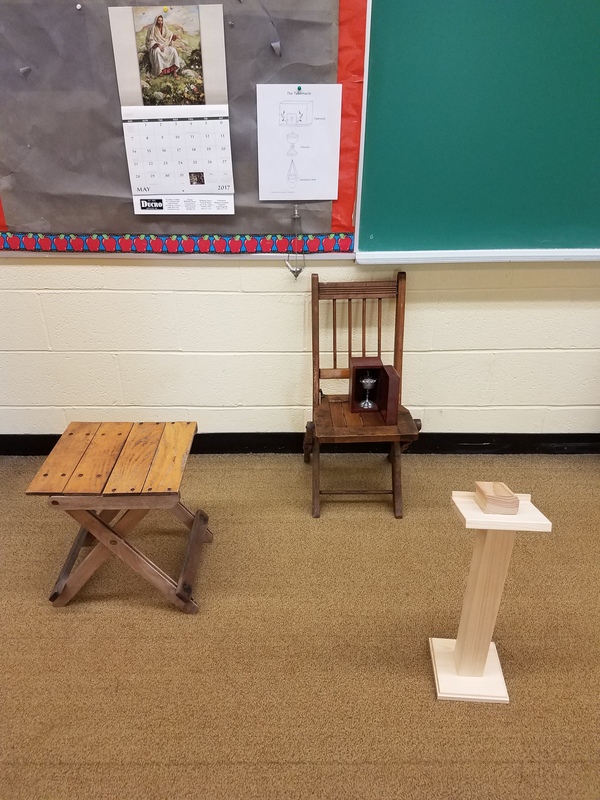 My students still work at their own level and pace, but I had no idea how much it would transform my teaching to pay close attention to THE ROOM. The right-sized furniture makes a big difference for little people. I agree that the physical environment matters for learning, but years in adult basic education trained me how to cope without control over my surroundings. Adult educators, particularly those in highly controlled residential facilities (i.e. Corrections) have to be some of the scrappiest, most resourceful people on the planet. I still have the habit of arriving 15-30 minutes early and staying late for set up and clean up, but now I can do so much more with the 75 minutes when my students are present. Yesterday I spent the whole day cleaning, organizing, purging the room from unwanted leftovers of yesteryear, and materials that are not age appropriate. 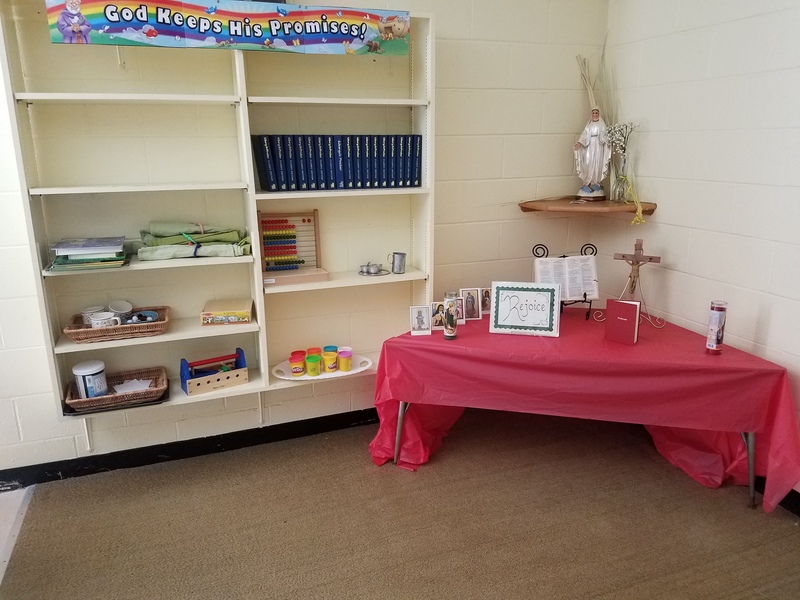 Our prayer corner and practical life works are much more attractive without distracting junk. As I cleaned, I realized that there are a few things I ignored all year (out of habit) that are now within my power to fix. Take this faded construction paper… before classes resume in September, I’ll replace or cover it. I have time planned in the workshop to replace some of my first-attempt, makeshift materials with painted wood. The apple borders are an unnecessary decoration, and take away from the solemnity of the altar work. I didn’t notice the black background was faded and torn. This sends a message to our students. Becaise this experience is nee, it’s taking up a lot of mental energy to force myself to pay attention to the physical environment. But that’s one of the gifts of Catechesis of the Good Shepherd, and the Montessori approach in general. We are asked to slow down and pay attention to the unnamed or subconscious messages we send to children through objects and behavior. 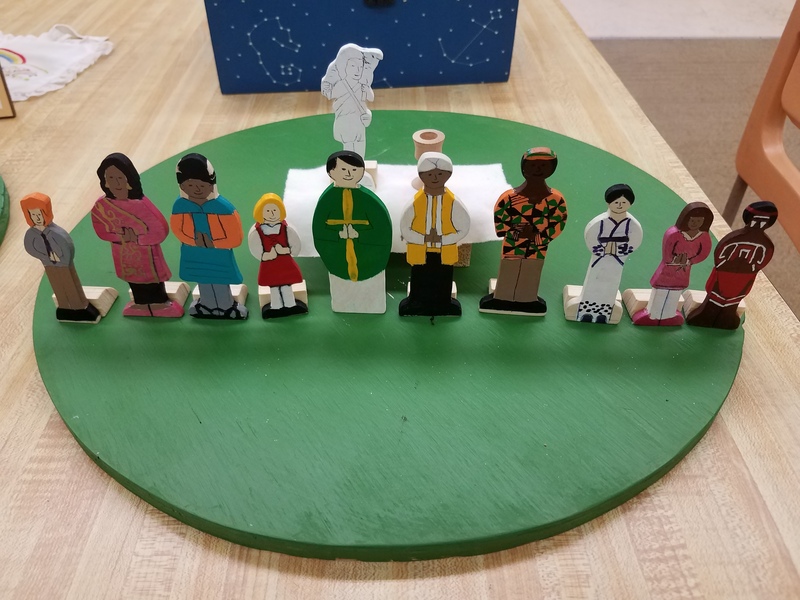 Jesus said “I have sheep not from this sheepfold.” I painted these figures to represent [Left to Right]: Ireland, India, Bolivia, Germany, our Pastor Fr Sheridan, Lebanon, Uganda, Japan, USA, Australian Aboriginals. 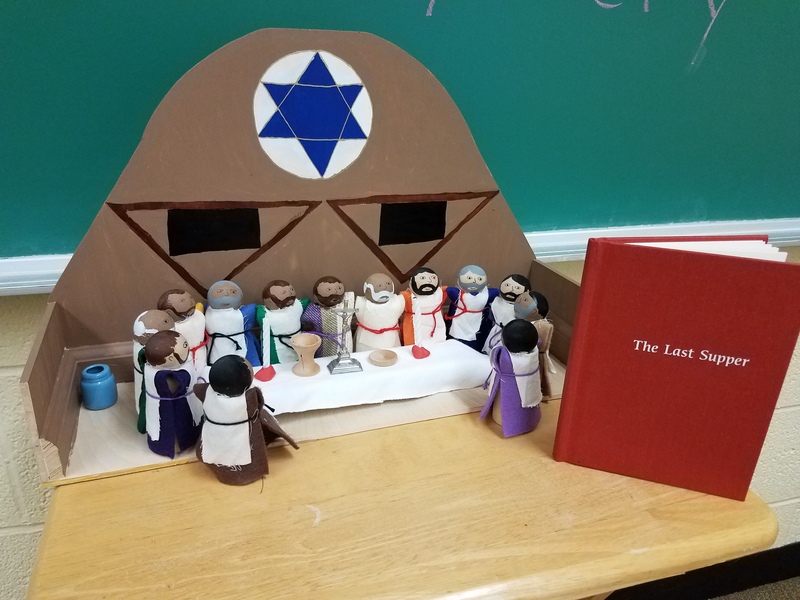 Catechists have a lot of flexibility in the materials, so the physical materials can be an opportunity to set up students to later absorb some bigger theological concepts. For example, in an age of violent anti-Semitism, I find it critical to emphasize the Jewishness of Jesus and His first disciples. Each Apostle is stamped with his name and a symbol representing his life or death. 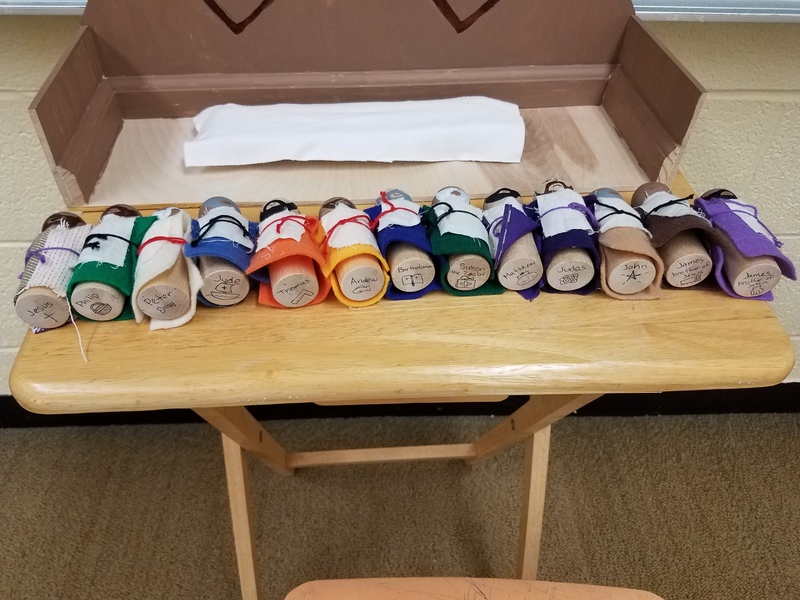 I also developed a couple additional presentations that I want to document and share this summer, like the 3 socks of the 3 poor girls saved from slavery by St Nicholas, Bishop of Myra. This work fit in nicely with the parables about finding the hidden treasure in the field, and selling everything for the precious pearl. 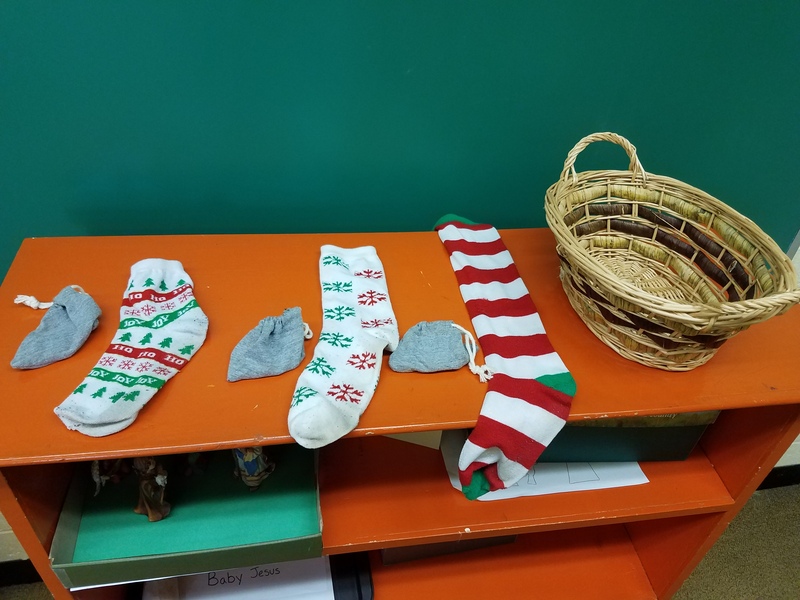 Legend has it that St Nick threw 3 bags of gold into 3 stockings for poor girls in trouble. This coming year, I hope to expand on this work in Catechesis of the Good Shepherd by using some of the principles, and even some materials, to teach adults who are new members in the church (RCIA). 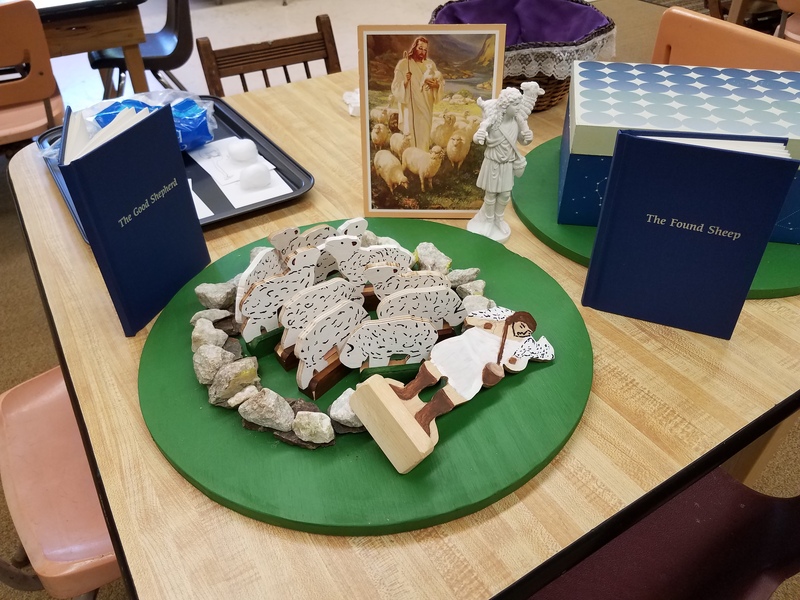 Adults as well as kids need the space to work with their hands, and reflect on their personal connection with the Good Shepherd. Adults like to color sometimes, too. What do you enjoy about having a classroom? Or what would you add if you had one?